The U.S. Marine Corps Forces Special Operations Command (MARSOC) will consist of two special operations battalions, a special operations support group and training services. The battalions will be divided into special operations companies attached to other Marine expeditionary units (MEU). The companies will provide the MEUs with a special operations capability while also conducting operations for the U.S. Special Forces Command (SOCOM). New organization provides U.S. forces with flexible, globally deployed sea-based assets. A service with a long history of creative solutions to military challenges is joining forces with the unconventional warfare community. The U.S. Marine Corps has established a special operations command that will work as part of a joint special forces group. Inaugurated on February 24 and headquartered at Camp Lejeune, North Carolina, the U.S. Marine Corps Forces Special Operations Command (MARSOC) is a component of the U.S. Special Forces Command (SOCOM). MARSOC will provide SOCOM with forward-deployed forces attached to Marine Corps expeditionary units, explains Col. Peter Petronzio, USMC, MARSOC’s chief operations officer. Scheduled to be fully operational by September 2008, MARSOC will consist of some 2,600 Marines and sailors divided into foreign military training units (FMTUs), special operations battalions, a special operations support group and a special operations school. The command is responsible for six core missions: direct action, special reconnaissance, foreign internal defense, counterterrorism, information operations and unconventional warfare. The most mature MARSOC forces in terms of readiness are its FMTUs. These personnel are specialized in assessing, instructing, advising and helping allied nations’ military forces support their governments’ internal security and stability, counter subversion and national security needs. Col. Petronzio notes that in the future the command also will train foreign troops in unconventional warfare tactics. Three 11-man teams are now ready to deploy globally, and he predicts that six teams will be active by the end of fiscal year 2006. FMTU operations are coordinated by SOCOM. MARSOC also will field two special operations battalions, one based at CampLejeune and the other at Camp Pendleton, California. The battalions will consist of several Marine special operations companies staffed with personnel skilled in special equipment support, intelligence and fire support. Each company will be commanded by a Marine major and will be capable of independently conducting special reconnaissance, direct action and foreign internal defense missions to support SOCOM. The special operations companies will deploy with Marine expeditionary units (MEUs) and will maintain a dual relationship by providing support to the MEUs and expeditionary strike groups as well as by conducting operations for SOCOM. The first Marine special operations companies are currently being formed. Col. Petronzio reports that they began training in mid-April and should be ready to deploy by December. The colonel describes this dual arrangement as a “win-win” situation because MARSOC companies add their capabilities to the MEUs with which they deploy; however, if SOCOM requires their services, they will carry out missions for the command. “As we mature, we will see how those relationships work out. I know what the command relationship will be, but functionally how will it work? We’ll put all the pieces in place, key everyone up for success and see how it goes,” he says. The command features a Marine Special Operations Support Group (MSOSG) responsible for sustaining global operations. The MSOSG provides combined arms planning and coordination, special operations communications support, logistics and an all-source intelligence fusion capability. It also can deploy specially tailored support detachments for SOCOM. Another key part of MARSOC is the Marine Special Operations School (MSOS). This institution will screen, recruit, train, assess and develop doctrine for the command. It includes two subordinate special mission training branches, one located on each coast. These sectors will provide instruction in tactics, techniques, procedures, evaluation and certification of Marine Corps special operations forces. The MSOS will be staffed with personnel experienced with coordinating, instructing and supervising the development of Marines’ special reconnaissance and direct action skills. The Marine Corps has its own intelligence, surveillance and reconnaissance (ISR) capabilities that it will provide to SOCOM. The MARSOC’s ISR contributions consist of signals intelligence, human intelligence, geospatial intelligence and information analysis assets. Col. Petronzio notes that the MARSOC will benefit from the combined experience of Marine intelligence personnel who are knowledgeable about operations at the battalion level and below. However, he cautions that the exact definition of an ISR capability lies in the eyes of the beholder. “Can we go out there, look at things and get to places other people can’t go? Yes, I think we can. In some people’s jargon, that’s ISR, and to other people that’s basic reconnaissance,” he maintains. By operating from naval platforms such as the USS Peleliu, MARSOC units will provide SOCOM with a readily deployable operational capability in crisis zones. The colonel believes the biggest advantage MARSOC provides SOCOM is a seaborne special operations force that can go anywhere in the world without overflight or basing requirements. “SOF [special operations force] is there when you need us there, and we’ll go do the things you need us to do. If you determine that by your personal or institutional definition to be ISR, that’s what we can do for you,” the colonel says. By deploying from the sea, the command also fits into the Marine Corps concept of ship-to-objective maneuver, but in this case, it is special operations forces, the colonel adds. He notes that mobility and sea basing provide SOCOM with a new operational capability. Because of the mobile nature of its mission, the MARSOC also will acquire command, control and communications systems from SOCOM that are slightly more sophisticated than current Marine Corps equipment. “SOCOM is making some of those [systems] available to us. We’re training to use them now so that we can bring all of those great capabilities to bear,” Col. Petronzio shares. As the MARSOC grows, it will incorporate troops from existing Marine Corps force reconnaissance units into its structure. The colonel notes that each special operations company also will have a contingent of reconnaissance Marines. A large number of troops may come from existing force reconnaissance units, but he adds that the command’s requirement is for individual Marines with this qualification. In the future, these specialists could come from anywhere in the Marine Corps before receiving additional specialist training through the MSOS, he explains. The personnel acquisition process operates by the command describing the capabilities it needs to the Marine Corps. “We say we need a wrench turner that looks like this or a communicator that looks like this. Then the Marine Corps will resource us with people meeting the baseline requirement. At MARSOC, we will interview, screen, assess and select at some point—we are not there yet—who those people are. And that’s how we will build this place,” he says. Establishing the command in a short period of time presents a variety of challenges. “We’re 230 years of tradition unhampered by progress on some days,” he quips. Acquiring personnel and equipment as well as preparing training and facilities for the command requires careful thought and planning. Another aspect is defining the command relationships between the MARSOC, the Marine Corps and SOCOM. “Now we answer to a different boss,” he observes. The MARSOC’s commanding general is subordinate to SOCOM. The colonel notes that the Marine command is just the fourth component of the combatant command, which includes the U.S. Army Special Operations Command, the U.S. Navy Special Warfare Command and the U.S. Air Force Special Operations Command. However, he believes that MARSOC is a benefit to the nation and that it provides added capability to both organizations. “There are always challenges to starting something new,” the colonel adds. Training for special operations is another consideration. Col. Petronzio believes that the Marine Corps’ current skills set offers an advantage as the command synchronizes its training with that of SOCOM. 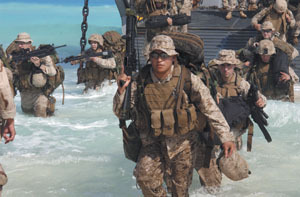 “Marines have always been ready for every climate and place, and we do a great job of training. Now we’re just taking it to that next level. As we identify what that next level is, we will work with SOCOM about what they do differently. Some of it is absolutely brand new types of training that we didn’t get. Some of it is just changing our tactics, techniques and procedures a little bit. We will mesh it all together. We bring the great stuff from the Marine Corps that we’ve already done. We add in a little bit, mix it all up, and we end up with an SOF-trained Marine,” he says. Joint training with other components of SOCOM is another vital aspect for the MARSOC. The colonel notes that he communicates with his counterparts from the other services, asking for advice and expertise, which is greatly helping with MARSOC’s establishment. “We’d be crazy not to train with them. Each of the [other service] components is 20-plus years old. Why would I not want to learn from 20 years of experience? I have no desire to go out and make mistakes that were made 15, 20 years ago,” he concludes.